Objective: Micronutrient deficiencies during pregnancy may be linked to poor newborn health and poor host defences against infection. We assessed newborn morbidity to determine the effect of four combinations of antenatal micronutrient supplements. Design: Cluster-randomised, double-masked, controlled trial. Setting: Rural community in Nepal. Interventions: Women received daily supplements from early pregnancy through to 3 months postpartum of vitamin A alone (control) or vitamin A with folic acid, folic acid plus iron, folic acid plus iron plus zinc or a multiple micronutrient supplement containing these and 11 other nutrients. Main outcome measures: Infants were visited in their home at birth (n = 3927) and for each of 9 days thereafter to elicit a 24-h history of nine infant morbidity symptoms, measure infant respiratory rate and axial temperature, and assess the infant for chest indrawing. At 6 weeks of age, infants were visited again in their homes to elicit a 30-day and 7-day history of 10 morbidity symptoms using parental recall. Results: Maternal micronutrient supplementation had no effect on 10-day morbidity or morbidity 30-day and 7-day morbidity assessed at 6 weeks of age all relative risks were close to 1. Symptoms of birth asphyxia increased by about 60% (p<0.05) in infants of women who received the multiple micronutrient supplement compared with the control. Symptoms of combinations of sepsis, preterm and birth asphyxia were associated with 8- to 14-fold increased odds of 6-month infant mortality. Conclusions: None of the combinations of antenatal micronutrient supplements tested improved symptoms of neonatal morbidity in the first 10 days of life or at 6 weeks of age. Further research is needed to elucidate the association and mechanism of increased risk of birth asphyxia following maternal multiple micronutrient supplementation. Neonatal morbidity and mortality continue to be high in many settings where births occur at home. Few studies have examined the risk of antenatal micronutrient supplementation effects on neonatal morbidity in the developing world. Maternal micronutrient supplementation does not appear to ameliorate the risk of neonatal morbidity. Multiple micronutrients may increase the risk of birth asphyxia in some settings, although the mechanisms remain unclear. Neonatal mortality contributes to two-thirds of all infant deaths in developing countries, owing primarily to birth asphyxia, infections and preterm birth.1 The burden of neonatal morbidity caused by these same conditions may be much higher and may affect infant growth, development and function in many settings. Micronutrient deficiencies during pregnancy are thought to contribute to neonatal morbidity.2–4 However, Costello and Osrin’s5 review of the literature covering the effects of micronutrient interventions on neonatal health suggested that additional community-based trials of micronutrient supplementation are needed to establish a causal linkage. In Nepal, we conducted a double-masked, cluster-randomised controlled trial of four different combinations of micronutrients given daily with vitamin A or vitamin A alone (as a control) to women from early gestation through to 3 months postpartum.11 12 We showed that the combination of iron and folic acid increased birth weight and decreased low birthweight relative to the control. The multiple micronutrient supplements failed to increase birth weight beyond that observed with iron and folic acid, but increased 3-month infant mortality among term infants.11 12 In this study we also assessed, daily, newborn morbidity in the first 10 days of life. Here we report the effect of maternal micronutrient supplementation on newborn health using previously validated definitions for neonatal morbidity. From January 2000 through April 2001, we conducted a double-masked, randomiaed, community trial of daily micronutrient supplementation during pregnancy through to 3 months postpartum in the rural southeastern Nepal district of Sarlahi. We examined the effect of four combinations of micronutrients: (1) 400 μg folic acid, (2) folic acid plus 60 mg iron, (3) folic acid plus iron plus 30 mg zinc, and (4) multiple micronutrients (folic acid, iron, zinc, 10 μg vitamin D, 10 mg vitamin E, 1.6 mg vitamin B-1, 1.8 mg vitamin B-2, 20 mg niacin, 2.2 mg vitamin B-6, 2.6 μg vitamin B-12, 100 mg vitamin C, 65 μg vitamin K, 2 mg copper and 100 mg magnesium) all given with 1000 μg retinol equivalents (RE) vitamin A, and all compared to vitamin A alone as the control, on birth weight and infant survival.11 12 The details of the study design have been published before. Briefly, the study area was divided into 426 sectors and randomisation was done using a sector as the unit. Pregnant women in the community were identified through a 5-weekly assessment using a urine-based β-hCG test conducted on those who reported being amenstrual in the past 30 days. Supplementation began in the week following the detection of pregnancy and continued during pregnancy through to 3 months postpartum. Dosing and supplement replenishment was done by 426 local female workers, one per sector, or about 40 households, by twice-weekly visits to the homes of the pregnant women. Pregnancy outcomes were monitored twice a week. Gestational age was assessed using the date of the last menstrual period and the window of 4 weeks prior to the week when the woman tested positive on the pregnancy test. A special data collection team visited the home of each woman soon after delivery to conduct a birth assessment including anthropometry and a detailed interview regarding labour and delivery. Subsequently, trained project staff visited the newborn every day through to the 10th day to elicit a 24-h maternal history of nine infant morbidity symptoms and to measure infant respiratory rate and axial temperature, and to assess the infant for chest indrawing. The symptoms assessed included difficulty sucking, lethargy, convulsions or stiffness of the back, red or purulent umbilicus, conjunctivitis, yellow body, severe chest indrawing, diarrhea, defined as six or more loose stools, and vomiting more than half a feed. In addition the staff were trained to measure respiratory rate and clinically assess chest indrawing using the World Health Organization IMCI video13 by senior members of an ongoing John Snow International project involving community-based assessment and treatment of pneumonia in Nepal. The video used in the training was adapted for Nepal and dubbed into Nepali and showed examples of rapid breathing and chest indrawing, and allowed trainees a chance to practice and get feedback. Axial temperature was also measured during each visit using a Mark of Fitness digital thermometer (HealthCheck Systems Inc, Brooklyn, NY). Among women who went to their parental home for delivery, the birth-assessment interview was conducted as late as 3 months postpartum. However, the 2- to10-day assessment was done only during the first 10 days of the newborn’s life. Thus, for newborn–mother pairs that were not met soon after birth, birth-assessment history was obtained by recall, but data were missing on the 10-day morbidity. At 6 weeks of age, the infant–mother pairs were again visited in the home to collect previous 30-day and 7-day histories of 10 morbidity symptoms using maternal recall. Infant mortality was assessed twice a week through to 3 months postpartum by female project workers who distributed the study supplements to women and again at 6-months of age. The date of death was ascertained within a week of death as part of a verbal autopsy interview. Using the 10-day morbidity data and data collected at the time of the birth assessment, we created definitions for sepsis, birth asphyxia, acute lower respiratory infection (ALRI) and hypothermia as described in table 1. Data from the 10-day morbidity and birth assessments were examined as percentages. The effect of micronutrient supplementation on 10-day morbidity was analysed using the generalised estimating equations (GEE) logistic regression model with supplementation group as an indicator variable and the control group as the reference, and each of the morbidities as the outcome.14 GEE analysis was used to adjust for cluster randomisation. Similar analyses were conducted using morbidity data collected at 6 weeks of age. Mortality rates in the first 6 months of life were calculated by presence or absence of one or more morbidities in the first 10 days of life. Odds ratios and 95% confidence intervals were calculated using GEE logistic regression with mortality as an outcome and the independent variable being morbidity symptom(s). All statistical analyses were done using SAS v 9.1 (SAS Inc., Cary, NC). Ethical approval for the study was obtained from the Committee on Human Research at the Johns Hopkins Bloomberg School of Public Health, Baltimore, USA, and the Nepal Health Research Council, Kathmandu, Nepal. Out of 4967 pregnancies monitored in the study, 4130 ended in a live birth, and 3927 (95% of live births) had birth-assessment data. Data for the first 10 days were collected for all surviving newborns whose mother was met at the time of the home visit. Thus, newborns who died soon after birth or in the first 10 days of life, or whose mother was not at home at the time of a scheduled visit, had missing data. In all, data were available for 3194 (77.3%) to 3275 (79.3%) newborns on any given day during the 10-day morbidity-assessment period. All data contributed by infants in the 10-day period prior to their death were included in the analysis. Data for the day of birth were available for more newborns (n = 3927) than for the subsequent 9 days of life because the birth-assessment interview was conducted beyond the first 10-day period of follow-up. Daily prevalence rates of nine signs and symptoms in the first 10 days of life showed varying patterns (fig 1). Prevalence of symptoms such as red or purulent umbilicus and diarrhea increased over the first few days, whereas symptoms of moderate to severe hypothermia and difficulty suckling declined after the first day. 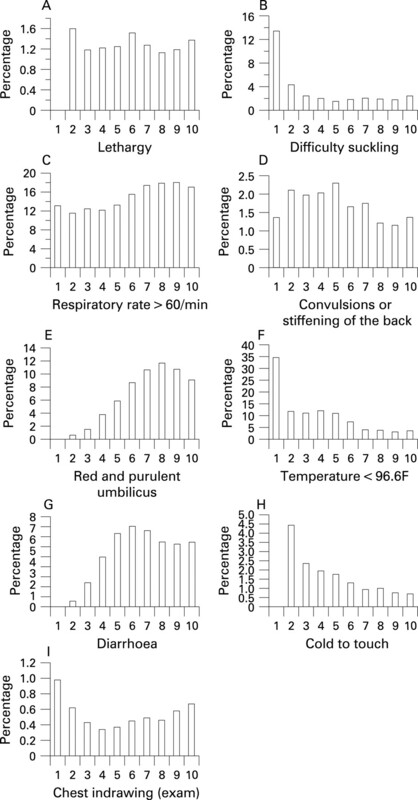 Respiratory rate of >60 breaths/min was observed among 11–18% of newborns on any given day, whereas convulsions/stiffening of the back occurred among <2.5% of newborns. Prevalence rates using maternal report of the infant being “cold to touch” in the past 24 h and axial temperature measurement of <96.6°F were highly comparable. Figure 1 Prevalence of morbidity signs and symptoms among infants in the first 10 days of life. Characteristics of newborns by treatment group are presented in table 2. Prevalence rates of sepsis, birth asphyxia, ALRI and hypothermia in the first 10 days ranged from 8–10%, 5–8%, <1% and 11–14%, respectively, across the treatment groups (table 3). Daily supplementation during pregnancy and the postpartum period with four combinations of micronutrients did not affect the prevalence of sepsis, ALRI and hypothermia in the first 10 days of life (table 3). Prevalence of birth asphyxia, however, defined using either algorithm, was about 60% higher in the multiple micronutrient group compared with the control. Previously, we showed that maternal supplementation did not affect the rate of preterm delivery.11 The impact of multiple micronutrient supplementation did not differ by maternal age, parity, birth weight (low birth weight vs. normal) and gestational age (data not shown). The design effect for the morbidities ranged from 1.03–1.90. Relative to infants who experienced no symptoms, infants who exhibited symptoms of either sepsis or birth asphyxia or were preterm were at a several-fold higher risk of mortality in the first 6 months of life (table 4). Moderate to severe hypothermia alone was not associated with an increased risk (data not shown). Combinations of symptoms of sepsis plus birth asphyxia, preterm plus birth asphyxia and preterm plus sepsis were associated with 8- to 14-fold increased odds of mortality. All three symptoms of birth asphyxia, preterm and sepsis were only found in 15 (<1%) infants and was associated with an increased odds of mortality of 29.6 (95% CI 18.8 to 46.5). Thirty-day and 7-day period prevalence rates of morbidity symptoms assessed at 6 weeks of age did not vary by treatment group (data not shown). Prevalence rates of symptoms in the previous 30 days that encompassed the neonatal period but excluded the first 10 days ranged from ∼1% for convulsions and jaundice to about 35% for vomiting (table 5). Prevalence rates of the same symptoms in the previous week were lower by a third to a half. In a rural community where 90% of births occur at home, we visited newborns daily during the first 10 days of life to determine the impact of antenatal micronutrient interventions on neonatal morbidity. We delineated daily prevalence rates of morbidity symptoms and found no benefit of maternal micronutrient supplementation on newborn health. The lack of impact of maternal supplementation on infant morbidity may be related to several factors. It is possible that because all the supplement groups included vitamin A, a potent anti-infective agent, any benefit beyond vitamin A was not discernable. However, maternal vitamin A supplementation alone was not associated with reduced neonatal mortality in an earlier trial.6 Zinc supplementation in infancy is known to reduce pneumonia,15 but we found a low risk of acute lower respiratory infection in the first 10 days of life, precluding our ability to find a reduction in this morbidity owing to supplementation. Maternal zinc supplementation has been shown to reduce the risk of acute diarrhea, dysentery and impetigo in Bangladesh among low birthweight but not normal weight infants.16 In contrast, the prevalence of diarrhea and dysentery at 6 weeks of age was the same across supplementation groups in our population in Nepal. There appeared to be no effect modification related to birth weight (data not shown). Difficulty sucking as a symptom of sepsis may not be specific on the first day or two of birth as it may be confused with difficulties in initiation of breastfeeding. Our data showed that the prevalence of this symptom was almost 14% on the first day but dropped to about 2–4% on subsequent days. Bang et al19 found a similar prevalence of feeding problems in the first week of life, and peak prevalence on the second day of life. Previously, we have shown that maternal folic acid with or without zinc supplementation reduced infant mortality (including neonatal mortality) among preterm births.12 Supplementation with multiple micronutrients resulted in an increase in birth weight and an elevated risk of birth asphyxia that may have resulted in an increase in mortality, although other mechanisms cannot be overruled.12 The current analysis also indicates an increased risk of birth asphyxia owing to multiple micronutrient supplementation. We have also published pooled data from two independent trials conducted in Nepal, one of which included the present trial, showing elevated risks of perinatal and neonatal mortality owing to multiple micronutrient supplementation compared with iron-folate alone.20 Maternal multiple micronutrient supplementation was shown to shift the whole distribution of birth weight to the right,21 a possible explanation for finding an increased risk of birth asphyxia among the higher birth weight infants. However, other mechanisms also need elucidating. In a poor environment such as that found in rural Nepal, antenatal micronutrient supplementation failed to improve symptoms of neonatal morbidity in the first 10 days of life or at 6 weeks of age. However, this should be weighed against the evidence that folic acid with or without added iron and/or zinc significantly reduced preterm neonatal and infant mortality. In contrast, supplementation with multiple micronutrients (beyond vitamin A, folic acid, iron and zinc) may have increased the risk of birth asphyxia associated with an increase in birth weight. Further research is needed to confirm this finding and the mechanism of the effect. Apart from the authors, all members of the Nepal study team helped in the successful implementation of the study including Field Managers and Supervisors and the Team Leader Interviewers who conducted the 10-day morbidity assessment; Elizabeth K. Pradhan and Gwendolyn Clemens were responsible for computer programming and data management.
. The plausibility of micronutrient deficiency in relationship to perinatal infection. J Nutr 2003;133:1645S–48S.
. Infection-related morbidities in the mother, fetus and neonate. J Nutr 2003;133:1656S–60S.
. The plausibility of micronutrient deficiencies being a significant contributing factor to the occurrence of pregnancy complications. J Nutr 2003;133:1597S–605S.
. Micronutrient status during pregnancy and outcomes for newborn infants in developing countries. J Nutr 2003;133:1757S–64S.
. Maternal low-dose vitamin A or ß-carotene supplementation has no effect on fetal loss and early infant mortality: a randomized cluster trial in Nepal. Am J Clin Nutr 2000;71:1570–76.
. Vitamin A or B-carotene supplementation reduces symptoms of illness in pregnant and lactating Nepali women. J Nutr 2000;130:2675–82.
. The need for maternal zinc supplementation in developing countries: An unresolved issue. J Nutr 2003;133:817S–27S.
. Randomised trial of effects of vitamin supplements on pregnancy outcomes and T cell counts in HIV-1-infected women in Tanzania. Lancet 1998;351:1477–82.
. .Trial of zinc supplements in relation to pregnancy outcomes, hematologic indicators, and T cell counts among HIV-1–infected women in Tanzania. Am J Clin Nutr 2005;81:161–67.
. Effects of alternative maternal micronutrient supplements on low birth weight in rural Nepal: double blind randomised community trial. BMJ 2003;326:571–74.
. Effects of maternal micronutrient supplementation on fetal loss and infant mortality: a cluster-randomized trial in Nepal. Am J Clin Nutr 2003;78:1194–202. World Health Organization. Thermal Control of the Newborn: A Practical Guide. Geneva, Switzerland: Maternal and Safe Motherhood Programme, Division of Family Health, 2003.
. Zinc supplementation reduces the incidence of acute lower respiratory infections in infants and preschool children: a double-blind, controlled trial. Pediatrics 1998;102:1–5.
. Zinc supplementation during pregnancy reduced morbidity from diarrheal diseases and impetigo in low-birth-weight infants during the first six months of life: a randomized, placebo-controlled trial. Lancet 2001;357:1080–85.
. Why do neonates die in rural Gadchiroli, India? (Part II): Estimating population attributable risks and contribution of multiple morbidities for identifying a strategy to prevent deaths. J Perinatol 2005;25:S35–S43.
. Accuracy of maternal perception of neonatal temperature. Indian Pediatr 1996;33:583–85.
. The incidence of morbidities in a cohort of neonates in rural Gadchiroli, India: Seasonal and temporal variation and a hypothesis about prevention. J Perinatol 2005;25:S18–S28.
. Antenatal micronutrient supplements in Nepal. Lancet 2005;366:711–12.
. Treatment effects of maternal micronutrient supplementation vary by percentiles of the birth weight distribution in rural Nepal. J Nutr 2006;136:1389–94. Funding: This work was carried out by the Center for Human Nutrition, Department of International Health of the Johns Hopkins Bloomberg School of Public Health, Baltimore, MD, USA in collaboration with the National Society for the Prevention of Blindness, Kathmandu, Nepal, under the Micronutrients for Health Cooperative Agreement No. HRN-A-00-97-00015-00 and the Global Research Activity Cooperative Agreement No.GHS-A-00-03-00019-00 between the Johns Hopkins University and the Office of Health, Infectious Diseases and Nutrition, United States Agency for International Development, Washington, DC, USA and grants from the Bill and Melinda Gates Foundation, Seattle, WA, USA and the Sight and Life Research Institute, Baltimore, MD, USA. Archives of Disease in Childhood 2008; 93 1-1 Published Online First: 21 Jul 2008.